Yellowstone bus at Gallatin Camp way station, 1937. Janet is on the right, her sister Joan is in the center, and her cousin Judy on the left. The summer of 2014 marks 75 years since author Janet Chapple first spent a summer season in Yellowstone. To celebrate, YellowstoneTreasures.com will serialize excerpts from her memoirs of her experiences from 1939 to 1942. Residing in Billings, Montana, my parents both made their livings as music teachers when I was a small child. In the summers they found jobs near Yellowstone Park, including managing the 320 Ranch in the Gallatin Canyon one year and working in the office of the Gallatin Gateway Inn another. Around 1937 and for either one or two summers, they ran the “Gallatin Camp” way station to service the park buses that brought Yellowstone visitors from Gallatin Gateway Inn to the West Entrance. 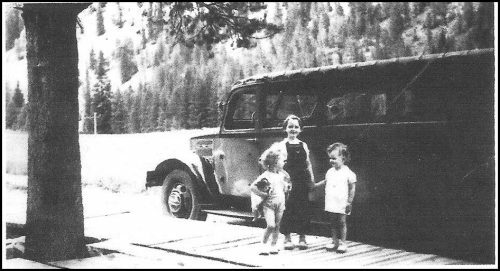 From looking through the Yellowstone Park Company payroll books held at Yellowstone’s archives, my sister Joan Orvis and I learned that my father, L. Worth Orvis, was employed as Assistant Transportation Agent for Old Faithful Inn in 1939, and that he advanced to be Transportation Agent in 1940. We were surprised to be reminded that we stayed at Old Faithful, not just in 1941, but also in 1942, when the war had begun to cut drastically into people’s summer vacation habits. I cannot remember which events and impressions took place in which years, except that 1939 was quite different from the others. I believe we stayed in one of the tourist cabins that year in the group of them that were east and south of the ranger station/museum, long since torn down. The main difference for us in 1939 was that that summer Mother (Margaret Inabnit Orvis) played in the Ladies’ Ensemble. More about that small musical group in the next post in this series . . . . According to a recent article in the Bozeman (MT) Chronicle: “The wheels on a bus service that shuttled Yellowstone National Park visitors into the park from gateway communities won’t be going around this year.” I’m sorry to hear this, since it was the only public transportation system that has been tried in many years, if not ever in Yellowstone. For three summers LINX was supported with help from local agencies. Even so—as we learned when my daughter needed the service between West Yellowstone and Old Faithful—it was not inexpensive. But total revenues did not cover operating costs, proving that only with government (National Park Service) support could such a system survive. I came up with a suggested plan for free or very inexpensive shuttle service for the west side of the park three years ago and even sent it to Park Superintendent Dan Wenk. Later I had a chance to speak with him about it, but, not surprisingly, he cannot consider such a thing in today’s economy. Here’s my plan. While today was opening day for Yellowstone’s major season, and tomorrow is the beginning of National Park Week, during which entrance fees will be waived, there is more good news. 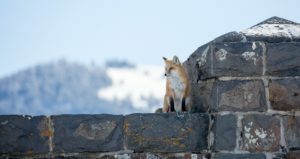 From June 15th to September 30th this year , visitors and park employees who want to or need to come to the park without a car can make connections between neighboring communities and points within Yellowstone on a system called LINX. This is not a tour company and is not government sponsored, but it surely answers a long-time need and makes a good start toward reducing traffic in the park. You can buy a pass for one day for $20 or five days for $80. You can also connect from as far away as Salt Lake City, UT or simply between Old Faithful and West Yellowstone, for example, with vehicles running in each direction around the northern Grand Loop Road twice a day. For all the details, see their easily navigable website: http://www.linx.coop or call 877-454-5469. My hope has been for several years to see a shuttle system in the most congested western part of this loop. Although I applaud the LINX system, it does not really solve the need to get from place to place within the park without a car. I’ve written a couple of blog posts about my ideas for park shuttles and even managed to sound off about it when I met Yellowstone Park Superintendent Dan Wenk during my January Tauck Tour in the park. If you’d like to read what my long-term scheme for such a system might comprise, I posted about transportation in 2009 and 2011 on this blog. Of course, there are problems with any plan one might come up with, not the least of which is finding the money for it, but I feel there ought to be an ongoing dialog about Yellowstone shuttles. Yellowstone Park needs a shuttle system! Although I know that the National Park Service has in the past considered inaugurating shuttle service in Yellowstone to alleviate road congestion and cut down on carbon emissions, perhaps the following plan has not yet been broached. I suggest that only the west side of this vast park could be well served by such a system. Here is my plan for a way we could accomplish this. I believe that providing a convenient shuttle service would greatly relieve summer congestion and would be used willingly by many visitors. Shuttle usage would be voluntary, and private vehicles and tour buses would continue to be allowed on the roads along with the shuttles. If the shuttle service were to be modeled after those at Yosemite, Bryce, and particularly Zion National Parks, it would be free. Having recently visited Zion and Bryce, I enquired how the system is paid for and was told that the equipment is owned by the National Park Service but operated by a concessionaire (at Bryce it is McDonald Transit Associates). Park entrance fees cover the expenses of running the shuttles. Shuttles could serve visitors along the roads between Mammoth in the north of the park and Old Faithful in the south central part. On this route are the majority of interesting hydrothermal features, as well as many other features of interest and hiking trailheads. All visitors who come in private cars, if they stay more than a day or two, usually want to visit much if not all of this region. My plan would serve visitors who leave their vehicles overnight or for several nights at Mammoth, West Yellowstone, or Old Faithful, or in the campgrounds at Norris or Madison. New parking areas might be required in some of these areas and could charge a reasonable fee for their use, something on the order of five to ten dollars per day. This parking fee could help to cover the cost of the shuttle system. The shuttle itself would be free and useable by any visitors or staff. Thus, people could go into and out of the park on the same day or, if staying in the park, could take belongings with them on the shuttle for several days’ use while staying in park facilities. Since no travelers who come from far away would want to carry all their belongings around while touring by shuttle, shuttle travel would have to be coordinated with the concessionaires at Mammoth and Old Faithful and with the management of private lodgings in West Yellowstone. In other words, visitors would leave most of their belongings at one of the three locations, in hotel/motel rooms if staying in the same place for several nights. Or if, for example, they wanted to stay one night in Mammoth or West Yellowstone and then stay a night or more at Old Faithful and return for their cars, baggage storage rooms could be provided at the motels and some space on the shuttles could be used for smaller baggage. Ideally, simple lunch rooms would be built by the NPS and run by the park concessionaire at Norris and Madison, utilizing part of the already-disturbed land in the present large parking lots. To make this plan work, I would propose that shuttles run at least every twenty minutes and for twelve hours per day between the end points, maybe from 9 am to 9 pm seven days a week. They should operate from mid June through mid September. A fleet of at least thirty electric, hybrid, or propane shuttles would be needed. There should be two round-trip routes: Mammoth campground to and from Madison Junction and West Yellowstone to and from Old Faithful Village, with correspondence at Madison. This system would require several dozen drivers. The shuttles would be large vans holding twelve to fifteen passengers. They would stop at every point along the roads that has something of general interest. Granted, this would mean a lot of stops, but the stops would mostly be very brief. Lesser-known features along the roads, such as the panoramic view at Swan Lake above Mammoth or the Chocolate Pots south of Norris Junction, should be included in the stops made by the shuttles. Most people would want to spend an hour or two at the major geyser basins but could easily time their visits to have a minimal wait for the next van, if they were spaced twenty minutes apart. Covered shelters with some seating would be needed at shuttle stops. A similar list of stopping points would be set up between other major places of interest or village areas with campgrounds or accommodations, where cars would be left. A total of 30 to 35 stops might be made between Mammoth and Old Faithful. In addition to the regular shuttles that make many stops, express shuttles would ferry staff and visitors to and from their vehicles at the end points three or four times a day. This system might eliminate more than half of the cars that use the roads between Old Faithful and West Yellowstone and Mammoth, saving fuel and cutting congestion on the roads, and improving the air quality and the overall Yellowstone experience. A shuttle system for Yellowstone? Comments Off on A shuttle system for Yellowstone? In a week or so I’ll be going on my first-ever visit to Zion National Park. Besides wanting to see the incredible scenery and geology, I am interested in finding out just how the shuttle system they have there works. I’ve felt for some time that Yellowstone could profit by having its own such system, but on a limited basis, since the park is so much larger than Zion—or Yosemite, which also uses shuttles. Yellowstone has a much more complicated array of roads than does either Zion or Yosemite, and most of Yellowstone’s roads are closed in winter, so a shuttle there needs to be limited to the most-traveled western section of the park and to the summer season. I plan to post here about my idea for a workable shuttle in Yellowstone, when I return in mid May. Almost two years ago I wrote a post about ideas then being tossed about for something similar. Major changes like this do not come quickly. This time, as gas prices and environmental concerns escalate, maybe I’ll send a letter about my plan and the need for action on creating a shuttle alternative, to the management of Xanterra, the park concessionaire, and to the new superintendent, Dan Wenk, who promises to be a decidedly forward-looking leader for Yellowstone. But I know he has a few other things on his plate!